From the Intramural Research Program, CNRM Co Director Biomarkers Core, Uniformed Services University of the Health Sciences (J.G.) and National Institute of Nursing Research (A.C., N.O., L.A., V.M., H.-S.K., S.Y. ), National Institutes of Health, Bethesda; Walter Reed Army Institute of Research (K.C.D., M.L., A.Y. ), Silver Spring; Army Medical Research and Materiel Command (W.C.), Fort Detrick; and Naval Medical Research Center (P.W., S.A.), Silver Spring, MD. Objective: To explore gene expression after moderate blast exposure (vs baseline) and proteomic changes after moderate- (vs low-) blast exposure. Methods: Military personnel (N = 69) donated blood for quantification of protein level, and peak pressure exposures were detected by helmet sensors before and during a blast training program (10 days total). On day 7, some participants (n = 29) sustained a moderate blast (mean peak pressure = 7.9 psi) and were matched to participants with no/low-blast exposure during the training (n = 40). PAXgene tubes were collected from one training site at baseline and day 10; RNA-sequencing day 10 expression was compared with each participant's own baseline samples to identify genes and pathways differentially expressed in moderate blast-exposed participants. Changes in amyloid precursor protein (APP) from baseline to the day of blast and following 2 days were evaluated. Symptoms were assessed using a self-reported form. 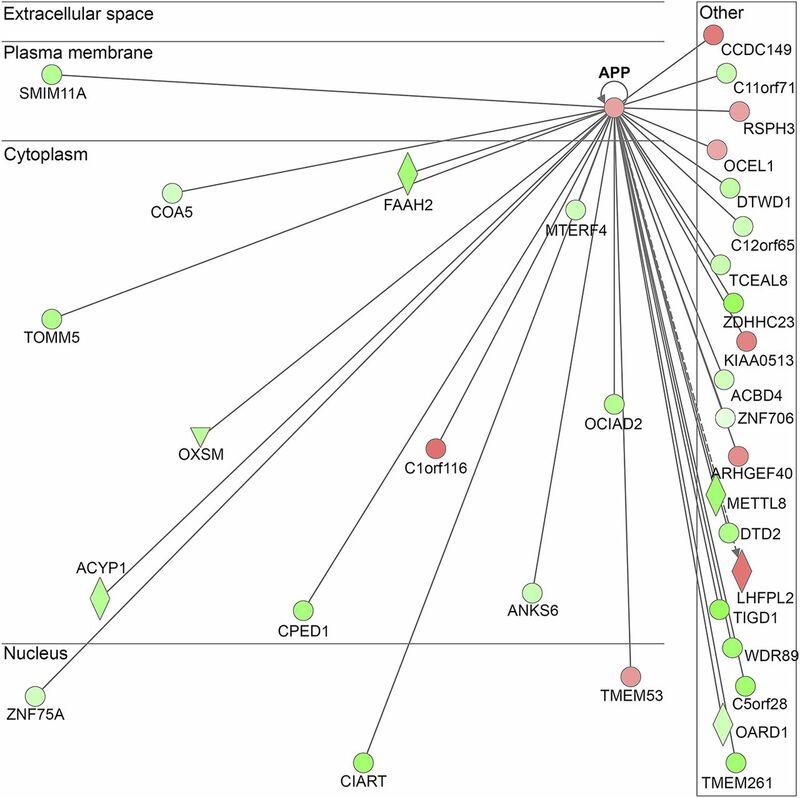 Results: We identified 1,803 differentially expressed genes after moderate blast exposure; the most altered network was APP. Significantly reduced levels of peripheral APP were detected the day after the moderate blast exposure and the following day. Protein concentrations correlated with the magnitude of the moderate blast exposure on days 8 and 9. APP concentrations returned to baseline levels 3 days following the blast, likely due to increases in the genetic expression of APP. Onset of concentration problems and headaches occurred after moderate blast. Conclusions: Moderate blast exposure results in a signature biological profile that includes acute APP reductions, followed by genetic expression increases and normalization of APP levels; these changes likely influence neuronal recovery. Proximity to a blast explosion results in exposure to an overpressure wave and can result in injury to the brain and body. In the military, overpressures occur due to a variety of sources including artillery and improvised explosive devices. At least 30% of military personnel involved in the Operation Iraqi/Enduring Freedom campaigns had a mild traumatic brain injury (TBI) as a result of blast exposure.1 Thus, there remains an impetus to better understand the molecular mechanisms underlying blast exposure, and the extent to which these biological changes account for behavioral, psychological, and cognitive symptoms to guide clinician decision-making and the development of novel therapeutics. Examination of gene activity through genetic expression analyses allows for the unbiased identification of pathways related to brain injury, including proteomic candidates. Previous studies in civilians with acute nonblast injuries,2 as well as in military personnel with a mix of blunt force TBIs and blast-induced TBIs (biTBIs),3 suggest that gene activities change following head injuries; however, previous studies have not acquired baseline samples, resulting in an inability to control for individual variability. The objective of this study was to identify biological pathways implicated in biTBIs in a cohort of military personnel who participated in a blast-related training. We hypothesized that moderate blast exposure would result in differential gene activity, determined through RNA sequencing (RNA-seq), when comparing postmoderate blast blood samples collected on day 10 with each participant's own baseline. This study is an initial examination of the association of changes in gene activity following moderate blast exposure in humans. Following this, we confirmed gene expression by performing quantitative PCR (qPCR) and examined proteins implicated in these gene-activity changes. Across 3 separate training sites, 108 active duty military personnel provided written informed consent to participate in this study while engaged in training as either students or instructors. All protocols were approved by the Institutional Review Boards at the Naval Medical Research Center and Walter Reed Army Institute of Research (NMCR#2011.0002; WRAIR#1796).4 There is no clinical trial identification number associated with the present study. Inclusion criteria for the present study included the following: (1) be active-duty military service member participants, (2) be enrolled in an advanced blast training program at 1 of 3 sites, and (3) be willing to provide blood samples. The 3 training sites used similar breaching blast exposures across a 2-week period, although the frequency and type of explosive charges used differed. All sites had standardization of data and biological sample collection. The participants in this study were representative of the larger military population from which they were drawn. On day 7, some participants (site 3) experienced a moderate blast, with a peak pressure greater than 5 psi (n = 29), and all were included in the present study. Participants from the other 2 sites served as no/low-blast controls (n = 79) but were excluded if they experienced a blast exposure exceeding 2 psi during the entire training program (n = 29), or did not have blood sampling on the days examined (n = 10). Prior to laboratory analysis, the moderate blast and no/low-blast groups were matched on demographic factors (age and duration of military service) and previous blast exposures; data for race/ancestry were not available and thus were not used during matching. We undertook a group matching method, with at least a 1:1 ratio of cases to controls. At the end of every training day, regardless of blast exposure, participants had blood drawn and completed behavioral measures of symptomology. Baseline data were collected on day 1 of training, including demographic characteristics, duration of military service, and prior blast exposure, using a previously described survey.4 Symptoms related to blast exposure were assessed using a symptom questionnaire4 to determine the onset of symptoms including headache, dizziness, nausea/vomiting, sensitivity to sound, sleep disturbance, fatigue, irritability, depression/sadness, frustration, anxiety, poor memory, poor concentration, longer thinking, blurred vision, light sensitivity, double vision, and loss of balance. The onset of symptoms was determined if the participant reported symptoms on day 7, 8, or 9, which were not reported at baseline. Participants also provided blood samples on day 1 and on each day of training. Bilateral sensors (Micro Data Acquisition System, μDAS; Applied Research Associates, Inc., Albuquerque, NM) affixed to each participant's helmet were used to record blast exposures on all training days; the average of the right and left sensors was used as raw data for peak overpressure (measured in psi). The helmet monitoring system has a threshold of 0.4 psi and records changes in ambient pressure, based on both the technological specifications of the sensors and considerations for signal-to-noise ratio. Blood for protein quantification was drawn from all participants on each training day between 1:600 and 1:800 hours, processed for serum, and stored at −80°C until processing. At 1 of 3 training sites, PAXgene tubes were collected at baseline and repeated on day 10; because all moderate blast cases (n = 29) occurred on day 7 at this site, this enabled us to evaluate gene expression changes from baseline to 3 days following moderate blast. Tubes were inverted 8–10 times and were placed upright for 2 hours at room temperature, at which point they were then moved to a −20°C freezer for 24 hours, and then to a −80°C freezer until processing. Matching of cases and controls was completed prior to running any laboratory assay. A complementary DNA (cDNA) library was prepared by random fragmentation of the cDNA followed by 5′ and 3′ adapter ligation. A total of 58 samples from 29 participants in the moderate blast-exposed group obtained at baseline and day 10 were assessed with RNA-seq using an Illumina HiSeq 2500 ultra–high-throughput sequencing system with paired-end 101 base paired-end reads. A subset of 4 genes that were found to be dysregulated in RNA-seq were validated using real-time qPCR with TaqMan assay-on-demand. Briefly, a high-capacity reverse transcription kit (Applied Biosystems, Foster City, CA) was used to synthesize cDNA from 10 µL of total RNA. One-tenth of diluted cDNA was mixed with TaqMan assay-on-demand and TaqMan gene expression master mix solution (Applied Biosystems). Triplicate reactions each totaling 6 µL were analyzed using qPCR (QuantStudio 6 Flex; Thermo Fisher Scientific, Waltham, MA); the data were processed with QuantStudio Real-Time PCR Software version 1.1 (Applied Biosystems). For protein analysis, amyloid precursor protein (APP) was chosen because (1) the statistical significance reflects the upregulation of APP after moderate blast (vs baseline); (2) the position of APP serves as a central hub in the ingenuity pathway analysis (IPA) diagram (figure 1)5; (3) the clear biological plausibility for a role of APP in biTBI pathology is well established in the preclinical blast literature.6,–,10 Specifically, APP concentrations were measured for all participants with an ELISA kit (Thermo Fisher Scientific); samples were randomized to the plates and run in duplicate. The coefficient of variation (CV) was assessed as a quality control measure; in the present study, the average CV was 5.7%, and all samples had CVs less than 10%. The network was generated using IPA (QIAGEN INC., qiagenbioinformatics.com/products/ingenuity-pathway-analysis). APP = amyloid precursor protein. The Statistical Package for the Social Sciences (SPSS; version 22; IBM Corporation, Armonk, NY) was used for all analysis. All figures were developed using GraphPad Prism. Analysis of variance (ANOVA) was used to compare the 2 groups (no/low vs moderate blast exposed); p values were 2 tailed and adjusted for multiple comparisons. Noncontinuous variables were evaluated using the χ2 test. Correlations between APP protein levels and blast parameters (psi) were calculated using Pearson correlation. An accuracy of Q30 or higher was achieved in 94.95% of base calls. A total of 52.2–75.5 million read counts were performed for each sample. Bioinformatics quality control was performed using FastQC, version 0.11.5; both before and after moderate blast, all samples met the quality control criteria for sufficient integrity based on RNA Integrity Number and were sequenced. Spliced Transcripts Alignment to a Reference version 2.5 was used to align to the hg19 reference genome. The number of reads mapped to each gene was counted using HTSeq version 0.6.1p1. Differentially expressed genes were identified using DESeq2 version 1.12.3; the cutoff for false discovery rate by Benjamini-Hochberg method was set to 0.05. Pathway analysis was performed using IPA version 27821452. To compare changes within the 2 groups over time, a repeated measures ANOVA was performed, and Bonferroni correction was applied to determine specific time points where the groups differed. Mean changes from baseline to days 7, 8, 9, and 10 were calculated and compared using an ANOVA. To evaluate the utility of APP as a peripheral biomarker for predicting moderate blast exposure, receiver operating characteristic plots were generated, and the area under the curve (AUC) was used to determine the performance of changes in APP levels (from baseline to days 8 and 9) in discriminating between the 2 groups. The onset of symptoms was determined if the participant reported having symptoms on days 2–10 that were mild, moderate, or severe and that were not reported at baseline. The onset of symptoms was determined as a dichotomous variable, and χ2 was used to compare the rates of each of the symptoms. We also used correlations to examine the relationships between APP changes on the onset of total and individual symptoms, using Pearson correlations. This sample included active-duty service members in the Army who were men. The mean age of the sample was 30.42 years (SD = 4.84) (table 1). The mean duration of service was 9.94 years (SD = 4.88), and 46.3% had more than 40 previous blast exposures. The groups did not differ in number of exposures reported at baseline and duration of military service. The onset of symptoms in the moderate blast cases and no/low-blast controls was compared on days 7, 8, and 9. On day 7, the onset of concentration problems (χ2 = 5.43, p = 0.03) and headaches (χ2 = 5.62, p = 0.03) was greater in the moderate blast group, with rates of 13.79% and 25.57%. On day 8, headache onset was higher in the moderate blast groups (χ2 = 7.30, p = 0.01), with a rate of 25.57%. There were no differences in any of the symptoms on days comparing groups (moderate blast group and controls) on days 1–6, or 9–10, p's > 0.30, or in the onset of these symptoms between the groups on days 2–6 or 9–10 (p's > 0.30). Changes in APP did not correlate with the total number of symptom onset (p > 0.30) or with any individual symptom onset (p > 0.30). Statistical analysis of RNA-seq data identified 1,803 genes that were differentially expressed after moderate blast exposure (vs baseline), as evidenced by a log2 fold change with an adjusted p value < 0.05. The 1,803 dysregulated genes included 746 upregulated genes and 1,058 downregulated genes following a moderate blast exposure (tables e-1 and e-2 at Neurology.org/ng); the top 20 up- and down-regulated genes are summarized in table 2. The IPA results showed that the APP gene network had the highest network score (value = 43) following moderate blast (figure 1). Real-time qPCR was used to validate the expression changes for 4 genes related to APP, including genes involved in APP processing and genes whose products interact with APP, namely amyloid precursor protein (APP), amyloid precursor–like protein 2 (APLP2), nicastrin (NCSTN), and NEDD8-Activating Enzyme E1 Subunit 1 (NAE1). Upon qPCR validation, dysregulation of these genes was confirmed (p = 0.00083476, p = 0.000105, p = 0.000673, and p = 0.043145, respectively). Differences were observed in the pattern of APP concentrations over time (F1,68 = 12.39, p < 0.01) with the moderate blast group having reductions on days 8 and 9 (all p's < 0.05), which then returned to baseline levels on day 10 (figure 2). The mean change in APP from baseline to day 8 differed (F1,60 = 18.74, p < 0.01) and day 9 (F1,59 = 20.49, p < 0.01) in the moderate blast exposure group compared with the no/low-blast group. The mean APP level reductions on day 8 in the moderate blast group were 4.17 pg/mL (SD = 3.60), compared with mean increases of 0.41 pg/mL (SD = 2.90) in the no/low-blast group. On day 9, the moderate blast exposure group had mean APP level reductions of 3.28 pg/mL (SD = 3.71), compared with reductions of 0.98 pg/mL (SD = 3.01) in the no/low-blast group. Differences in APP concentrations over time (F1,68 = 12.39, p < 0.01) were observed, with the moderate blast group exhibiting reductions on days 8* and 9* (p's < 0.05). APP = amyloid precursor protein. The mean changes in APP from baseline tended to correlate with the peak pressure measurements on day 8 (r = 0.62, p < 0.01) and day 9 (r = 0.59, p < 0.01). The mean changes in APP from baseline did not correlate with day 7 peak pressure measurements (p > 0.10, figure 3, A–C). Last, the AUC analysis revealed that the change in APP from baseline to day 8 (AUC = 0.802, 95% confidence interval: 0.683–0.918, p < 0.001) and to day 9 (AUC = 0.800, 95% confidence interval: 0.687–0.914, p < 0.001) distinguished moderate blast-exposed participants from those who experienced no/low-blast exposure. There was no correlation between mean changes in APP from baseline to peak pressure measurements on day 7 (p > 0.10) (A). The mean changes in APP from baseline correlated with peak pressure measurements (in psi) on day 8 (r = 0.62, p < 0.01) (B) and day 9 (r = 0.59, p < 0.01) (C). APP = amyloid precursor protein. The primary finding of the present study was that APP protein concentrations significantly reduced acutely following a moderate blast exposure and returned to baseline levels within 3 days of the moderate blast, addressing the objective of the study, and proving that our hypothesis that gene activity would change following moderate blast exposure. This rapid recovery pattern of protein levels may relate to the observed increases in APP gene activity on day 10 in the moderate blast group. 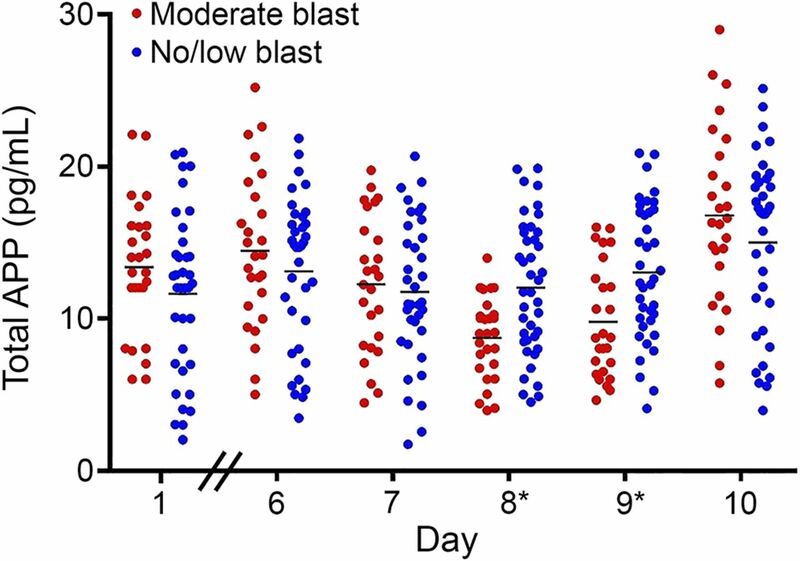 Taken together, these findings suggest that blast exposure alters the activity of APP with temporal changes in the biological activity of the APP gene after moderate blast exposure. A secondary finding was the onset of headaches, concentration problems, and taking longer to think on the 2 days following the moderate blast exposure. These findings provide unique insights into how peripheral gene activity and proteomic activities change following blast and provide insights into how these changes may relate to neuronal and symptomatic risks. The finding of reduced APP levels within the 2 days following blast was surprising because most preclinical studies of blast exposures report acute elevations in APP in brain tissue. Blast exposure of 22 psi resulted in APP reactive axons within the white matter tracks of the cervical spinal cord in rats at 6- and 24-hour postexposure.7 In a similar study, βAPP+ axonal profiles were reported on days 1 and 2 in the white matter following a 70 psi blast.8 Another study showed that APP levels increased in the brains of rats and mice after blast overpressure, though no evidence of APP staining in axons was found.10 A similarly designed study reported that an open-field blast exposure (peak pressure = 26.1 psi) in rats led to decreased cerebral blood flow on days 3 and 5 postinjury and an increase in βAPP in the neuronal perikarya of the cerebral cortex.9 Notably, most preclinical models use higher blast exposure levels to induce TBIs and examine central changes by analyzing brain samples directly. This method, however, is not feasible in clinical cohorts, where peripheral blood is predominantly studied. This study reports decreases in peripheral APP in a military cohort exposed to primary blast. It is possible that the acute decrease on days 8 and 9 reported in this study may have clinical consequences. APP has been well established as being elevated in the brain acutely after biTBIs,6,–,10 as well as blunt force TBIs in preclinical models and penetrating injuries in military personnel.11,12 However, it has been posited that APP plays a neuroprotective role after TBI.13 Traditionally, the ubiquitously expressed APP has been considered a marker of axonal injury, known to increase after TBI and to relate to the severity of neuronal injury.14,15 APP has also been implicated in neuronal plasticity and signaling,16 formation of neurites,17 as well as prevention of iron accumulation and subsequent iron-induced oxidative damage after TBI.18 Thus, the observed reductions in the peripheral APP activity may relate to central changes, as it has been found for central and peripheral levels of other biomarkers after TBI.19 However, it is also possible that the APP detected was from well-studied noncentral sources, including platelets, mononuclear blood cells, and other extraneuronal cell types20,–,23; notably, given the whole-body nature of the blast exposure the military personnel sustained, peripheral expression changes cannot be excluded. APP changes after blast exposure also may be relevant to the identification of potential therapeutic targets. Measuring symptoms acutely, and the months and years following a blast injury, is critical for creating an accurate clinical profile for diagnosing and predicting the trajectory of recovery for biTBI in military personnel. The onset of reported headaches on days 7 and 8 builds on a previous study that found blast-exposed military personnel more frequently reported headaches and tinnitus than those with nonblast injuries.24 While there are previous reports of minimal differences between the cognitive symptoms after biTBIs and nonblast TBIs,25 very little is known regarding the specific cognitive sequelae of biTBI, in clinical samples. In a study measuring the acute symptoms following a biTBI and long-term outcomes, loss of consciousness and altered mental status predicted posttraumatic stress disorder and postconcussive syndrome.26 In the present study, the onset of symptoms, including taking longer to think and concentration problems observed on days 7 and 8, suggests that biTBIs may initiate immediate cognitive repercussions that quickly resolve by day 9. A limitation of this study is the lack of longer-term protein levels and symptom profiles; the trajectory of symptoms may prove critical for guiding the clinical and rehabilitation recommendations postinjury. Despite this limitation, however, these findings have important clinical implications for further understanding acute symptomatic outcomes following blast exposure. Moreover, though the sample was generally representative of the military, it was composed exclusively of men of a narrow age range and may not be generalizable to women or older individuals. Developing a better understanding of APP changes after blast is important because it is probable that APP-related pathology may contribute to risk of chronic neurodegenerative conditions. One study of World War II veterans found that moderate and severe TBIs were associated with increased risk of Alzheimer disease,27 a condition also well characterized by changes in APP. Moreover, a study using post mortem brain tissue of military members found that among those with a history of blast exposure, APP+ axonal varicosities were present in the white matter of the frontal cortex, corpus callosum, cerebellum, and superior cerebellar peduncle.28 The findings of this study, in the context of existing published evidence, suggest that changes in APP occur after blast exposure and remain to be further clarified. The observations of a restoration of APP levels 3 days following the blast are likely due to compensatory upregulation of gene expression; in this study, increased APP gene activity was observed at day 10 (compared with baseline) using RNA-seq with qPCR validation. Upregulation of APP messenger RNA has been previously reported after experimental TBI,6 suggesting that this central activity may result in the rebound of APP concentrations. Still, future studies should clarify the mechanism of the changes in APP levels by including additional time points to relate protein changes to gene activity. It could be that unexplored changes in gene expression early after blast lead to downregulation of APP. Another possible explanation is that sequestration of APP is occurring somewhere in the CNS leading to decreased peripheral levels; this speculation may be the case if APP is playing a protective role within the brain. Likewise, blast may alter the flow of proteins from the brain to the periphery through alterations in glymphatic flow, clearance mechanisms, homeostatic control mechanisms, or currently undiscovered mechanisms. This study reports temporal changes in APP biological activity after a moderate blast, suggesting a role for APP in biTBI pathophysiology; the rebound in APP levels observed could be due to compensatory mechanisms after moderate blast, representing avenues for further research. These findings from a well-characterized cohort provide unique insights surrounding how peripheral changes in gene expression and levels of associated protein are altered after blast exposure. A major limitation of the current study is that an examination of the impact of lower blast exposure if not included on gene activity or APP. Our goal for this pilot study was to optimize discrimination between groups, and for this reason we excluded those participants with blast between 2 and 5 psi on any training day, resulting in an inability to determine the impact of lower level blast exposures. Future studies would be strengthened by the recruitment of larger, more diverse samples and the inclusion of a variety of blast exposures and additional time points to gain a comprehensive understanding of the mechanism(s) underlying the changes in protein biomarkers reported in the present study. This study makes key contributions to the current understandings of the implications of biTBIs, while raising important questions to guide future inquiry. J.G., A.C., N.O., L.A., V.M., H.-S.K., and S.Y. : contributions to the conception and design of the work, laboratory analysis, interpretation of the data, and drafting the work. K.C.D., W.C., P.W., S.A., M.L., and A.Y. : contributions to the collection, interpretation of the data, and drafting of the work. All authors provided final approval of the manuscript. This study was funded by the National Institutes of Health, Intramural Department of Research, and the U.S. Army Medical Research and Materiel Command and the U.S. Navy Bureau of Medicine and Surgery (WUN 603115HP.2380.001.A1304). Material has been reviewed by the Walter Reed Army Institute of Research. There is no objection to its publication. The opinions and assertions contained herein are the private views of the authors and are not to be construed as official, or as reflecting true views of the Department of the Navy, Department of the Army, the Department of Defense, the Uniformed Services University of the Health Sciences, or any other agency of the U.S. Government. The study protocol was approved by the Naval Medical Research Center and Walter Reed Army Institute of Research Institutional Review Boards in compliance with all applicable Federal regulations governing the protection of human subjects. The investigators have adhered to the policies for protection of human subjects as prescribed in AR 70–25. MAJ Carr, LCDR Walker, MAJ LoPresti, and MAJ Yarnell are military service members. Dr. Ahlers is an employee of the U.S. Government. This work was prepared as part of their official duties. Title 17 U.S.C. §105 provides that ‘Copyright protection under this title is not available for any work of the United States Government.’ Title 17 U.S.C. §101 defines a U.S. Government work as a work prepared by a military service member or employee of the U.S. Government as part of that person's official duties. J. Gill and A. Cashion have received research support from NIH. N. Osier, L. Arcurio, and V. Motamedi report no disclosures. K.C. Dell is an employee of Walter Reed Army Institute of Research (WRAIR). W. Carr has received research support from the United States Government (he is a military service member) from the U.S. Army Medical Research and Materiel Command and from the U.S. Navy Bureau of Medicine. H.-S. Kim reports no disclosures. S. Yun is the CEO of Yotta Biomed, LLC and has received research support from NINR, NIDDK, and NHLBI. P. Walker has received research support from Joint Program Committee FIVE, Occupational Standards for Repeated Blast Exposure, BUMED WII, and the Office of Naval Research. S. Ahlers has received research support from the U.S. Army (JPC5 intramural award, Blast Exposure Standards). M. LoPresti has received research support from the United States Government (he is a military service member). A. Yarnell has received research support from the U.S. Army (JPC5 intramural award, Blast Exposure Standards). Go to Neurology.org/ng for full disclosure forms. Thank you to the leadership from the U.S. Army Special Operations Command and U.S. Army Engineer School for their support. We also thank the military personnel for their service to our nation and their participation in this study. Funding information and disclosures are provided at the end of the article. Go to Neurology.org/ng for full disclosure forms. The Article Processing Charge was funded by NIH, Army, Navy. Accepted in final form June 30, 2017.
. Invisible Wounds of War. Santa Monica: RAND Corporation; 2008.
. Differential gene expression associated with meningeal injury in acute mild TBI. J Neurotrauma 2016;34:853–860.
. Military personnel with chronic symptoms following blast traumatic brain injury have differential expression of neuronal recovery and epidermal growth factor receptor genes. Front Neurol 2014;5:198.
. Ubiquitin carboxy-terminal hydrolase-l1 as a serum neurotrauma biomarker for exposure to occupational low-level blast. Front Neurol 2015;6:49.
. Causal analysis approaches in ingenuity pathway analysis. Bioinformatics 2014;30:523–530.
. Upregulation of amyloid precursor protein and its mRNA in an experimental model of paediatric head injury. J Clin Neurosci 2000;7:140–145.
. Blast overpressure induced axonal injury changes in rat brainstem and spinal cord. J Neurosci Rural Pract 2015;6:481–487.
. A novel closed-body model of spinal cord injury caused by high-pressure air blasts produces extensive axonal injury and motor impairments. Exp Neurol 2015;271:53–71.
. Multi-echo susceptibility-weighted imaging and histology of open-field blast-induced traumatic brain injury in a rat model. NMR Biomed 2015;28:1069–1077.
. Acute blast injury reduces brain abeta in two rodent species. Front Neurol 2012;3:177.
. Protein profiling in serum after traumatic brain injury in rats reveals potential injury markers. Behav Brain Res Epub 2016 Aug 31.
. Subacute changes in cleavage processing of amyloid precursor protein and tau following penetrating traumatic brain injury. PLoS One 2016;11:e0158576.
. The neuroprotective properties of the amyloid precursor protein following traumatic brain injury. Aging Dis 2016;7:163–179.
. Staining of amyloid precursor protein to study axonal damage in mild head injury. Lancet 1994;344:1055–1056.
. Beta-amyloid precursor protein (beta APP) as a marker for axonal injury after head injury. Neurosci Lett 1993;160:139–144.
. Roles of amyloid precursor protein family members in neuroprotection, stress signaling and aging. Exp Brain Res 2012;217:471–479.
. A heparin-binding domain in the amyloid protein precursor of Alzheimer's disease is involved in the regulation of neurite outgrowth. J Neurosci 1994;14:2117–2127.
. Ceruloplasmin and beta-amyloid precursor protein confer neuroprotection in traumatic brain injury and lower neuronal iron. Free Radic Biol Med 2014;69:331–337.
. Correlation of cytokine levels in peripheral blood, brain interstitial space and cerebrospinal fluid in traumatic head injury: P 012. Eur J Anaesthesiology 2008;25:4–5.
. Estrogen receptor alpha promotes non-amyloidogenic processing of platelet amyloid precursor protein via the MAPK/ERK pathway. J Steroid Biochem Mol Biol 2014;144(pt B):280–285.
. Amyloid precursor protein in platelets: a peripheral marker for the diagnosis of sporadic AD. Neurology 2001;57:2243–2248.
. Enhanced production of amyloid precursor protein mRNA by peripheral mononuclear blood cell in Alzheimer's disease. Am J Med Genet B Neuropsychiatr Genet 2003;118B:99–102.
. The production of the Alzheimer amyloid precursor protein (APP) in extraneuronal tissue does not increase in old age. J Gerontol A Biol Sci Med Sci 1998;53:B186–B190.
. Mild traumatic brain injury (concussion) during combat: lack of association of blast mechanism with persistent postconcussive symptoms. J Head Trauma Rehabil 2010;25:9–14.
. Comparison of concussive symptoms, cognitive performance, and psychological symptoms between acute blast-versus nonblast-induced mild traumatic brain injury. J Int Neuropsychol Soc 2011;17:36–45.
. Influence of combat blast-related mild traumatic brain injury acute symptoms on mental health and service discharge outcomes. J Neurotrauma 2013;30:1391–1397.
. Documented head injury in early adulthood and risk of Alzheimer's disease and other dementias. Neurology 2000;55:1158–1166.
. The problem of axonal injury in the brains of veterans with histories of blast exposure. Acta Neuropathol Commun 2014;2:153.